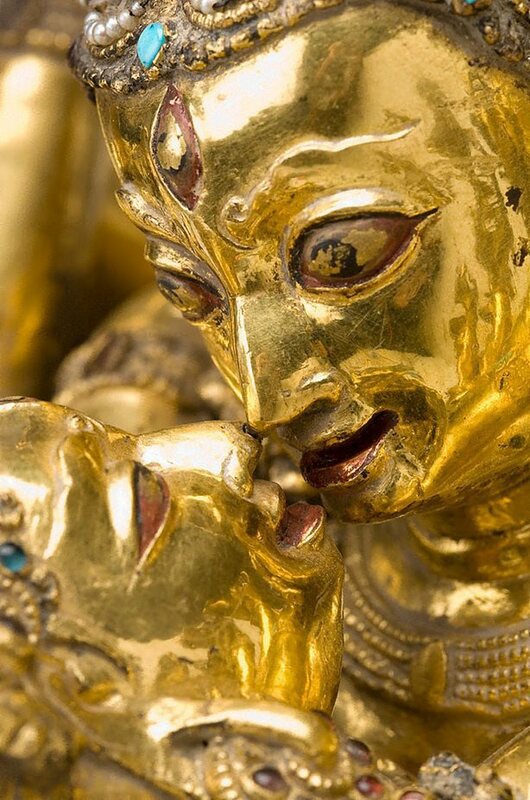 This extraordinary sculpture shows the Buddha couple Kalachakra and Vishvamata locked in passionate embrace, lovingly gazing at each other. Both figures are four-headed, with the lips and eyes on each face marked with pigments, lending added naturalism to the sculpture. 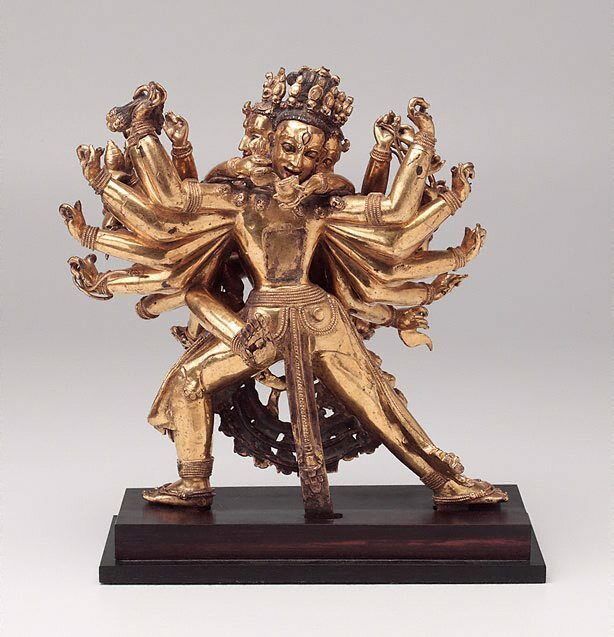 Typical of Heruka Buddhas, Kalachakra strikes an energetic, lunging pose and Vishvamata mirrors his stance. Both figures wear elaborate jewellery, studded with brilliant blue turquoise and inlaid with semi-precious stones. 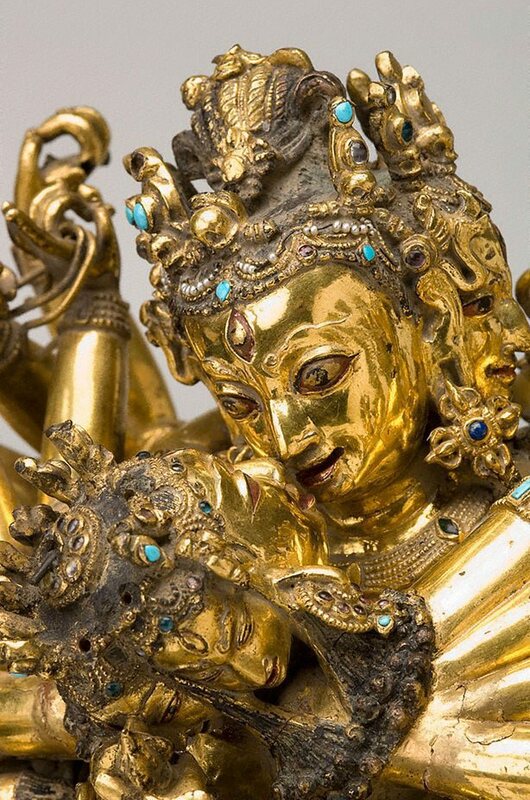 The delicate festoon of pearls that hangs from Kalachakra’s headdress deserves particular attention. Kalachakra’s twenty-four hands and Vishvamata’s eight, surrounding the couple like a golden aura, each originally held an attribute. 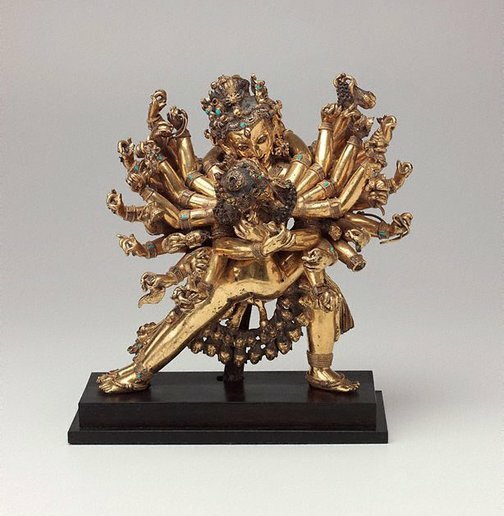 Among the objects that survive in Kalachakra’s hands are the ‘vajra’ and bell, a partially broken sword, a flaying knife, a double-sided pellet drum, the Buddhist wheel, a ‘vajra’-tipped noose, a conch shell and a gem-encrusted jewel. In Kalachakra’s uppermost raised hand dangles the severed head of the four-faced Hindu god Brahma (‘Brahmakapala’). Although seemingly gruesome, this attribute symbolises Kalachakra’s infinite compassion towards all beings (Beer 1999: 309). Vishvamata holds a flaying knife and skull cup in her main hands hidden behind Kalachakra’s neck. Other implements that remain in her additional hands include a noose, a pellet drum, a lotus and a jewel. The figures’ striking pose, the intimacy they share and the dazzling display of arms create a dynamic tour de force. Chaya Chandrasekhar, ‘Goddess: divine energy’, pg.252. Chaya Chandrasekhar, Look , 'Kalachakra', pg. 24-27, Sydney, Mar 2006, front cover (colour illus., detail), 24 (colour illus. ), 25 (colour illus. ), 26-27 (colour illus., detail). Susan Owens, The Weekend Australian Financial Review , 'Mystique of the Orient', pg. 31, Sydney, 22 Oct 2005-23 Oct 2005, 31 (colour illus., detail). Art Gallery of New South Wales: highlights from the collection , Sydney, 2008, 182 (colour illus.). Look , Sydney, Nov 2005, 11 (colour illus., detail).